Baton Rouge, LA – June 26, 2013 – Lamar Advertising Company (Nasdaq: LAMR) has released the newest version of its free interstate travel app RoadNinja 3.0. The location-based app helps consumers find what’s available at upcoming exits (restaurants, hotels, gas, etc.). 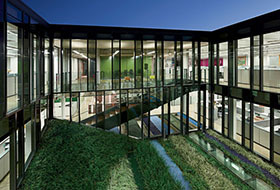 Users determine the best exit to take by browsing selected business categories or by searching for a specific venue. Cost-conscious travelers can use RoadNinja to save money with promotions and to view gas prices on the app. RoadNinja 3.0 features an enhanced exit list helping users choose their stops more wisely, the ability to share places and promotions through social media channels and a redesigned settings menu giving users a higher degree of customization. The newly designed interface offers more relevant information to the user with a cleaner, simpler look. Travelers can use RoadNinja to plan their road trip with a directory of every interstate and exit in the U.S. In addition, users can use NEARBY mode when traveling off the interstate to find the nearest local venues and access directions, respectively. RoadNinja incorporates Google Street View, giving users a 360 degree panoramic view of places listed in the app. RoadNinja makes it easy to access information and view photos of each venue which are updated through Foursquare. RoadNinja’s social component now offers better integration between Facebook, Twitter, and Google+ and offers aggregate user reviews for places in the app. Businesses have the ability to link their own social media feeds into RoadNinja to directly reach people on the go. To date, RoadNinja has been downloaded by over 650,000 users and has a 4.5 star rating in the iTunes Store. The app is available to download free on iOS and Android devices. Lamar Advertising Company is launching a national out-of-home campaign to promote the launch of RoadNinja 3.0. The campaign begins on June 25 and will feature designs on Lamar’s static and digital billboards in over 200 markets nationwide. 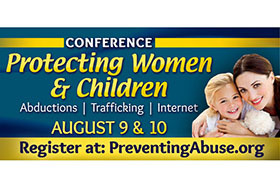 Lamar Advertising Company has donated billboard space to the Preventing Abuse organization to help raise awareness for their upcoming conference in Cedar Rapids, Iowa.